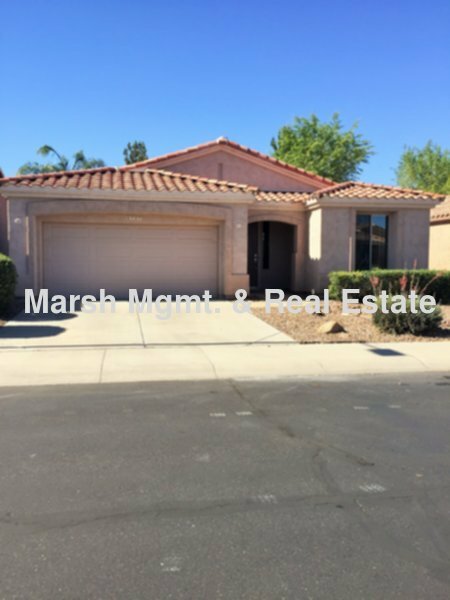 Residential Rental Listing 2 bed 2 bath in Gilbert, AZ. Beautiful 2 bedroom home in Trilogy (55 & older community)! beautiful 2 bedroom home in trilogy (55 & older community)! Queen Creek / Power - West on Queen Creek to Trilogy entrance & check in at Main Guard. Turn left after guard house to Appleby, right on Citrus, left on Carob. Upscale retirement living in a gated community! Please go through guard shack off of Queen Creek. Must be 55 years or older to reside in this community. Must see this beautiful home located not far from the golf course! This cozy home offers a split bedroom floor plan. All appliances, lots of tile, 2 nice size bedrooms & 2 full baths, easy maintenance desert landscaping, 2 car garage & community pool. Greenbelt area across the back with low wall so you can enjoy the view. This is a golf course community with beautiful club house and restaurant. Gas & electric. No smoking please. Sales tax will apply to monthly rent. Security deposit will equal at least one month's rent. Tenants must provide proof of Renter's Insurance prior to moving in. Owner may approve 1 small dog. Please call regarding pets. Please refer to Policies on Renting for important information.